Welcome to My Cricut Craft Room's October's Blog Hop. Collectively the design team and guest designers have made some amazing and special projects to share with you... over 60 projects are on this hop, but it is in less than 20 stops. 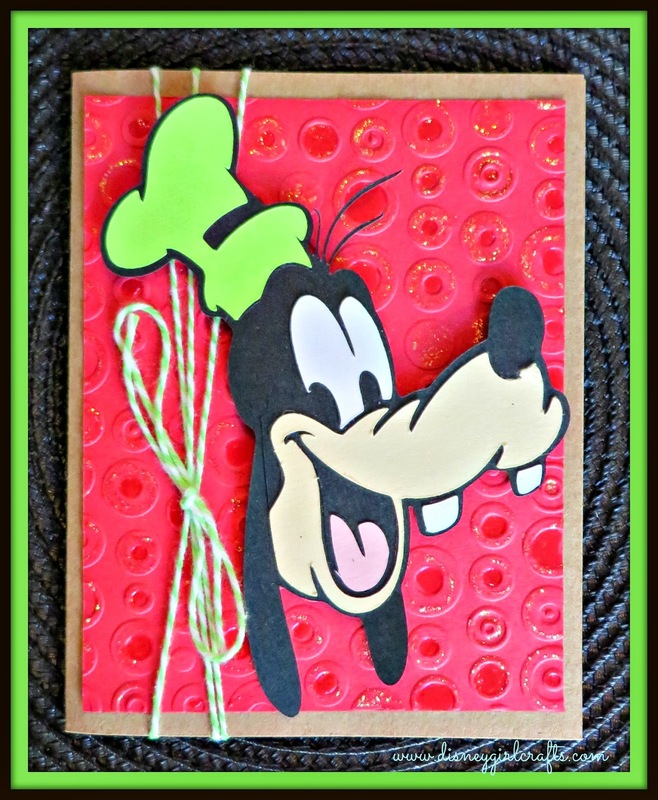 I am so excited to be part of the fun and would like to welcome you to Disney Girl Crafts and Other Fun Things. I am stop number 9 along the way. You should of hopped on over from stop 8 and that is Curls and Grins. If for some reason you started in the middle of the hop head on over to My Cricut Craftroom and start at the very beginning. You definitely don't want to miss out on any of the fun. I have a couple of cards to share with you. Up first is Goofy. Goofy was cut using the Cricut cartridge Mickey Font. Unfortunately I did not write down what I cut him at. (sorry!) If I had to guess he is cut at 5 inches. An embossing folder was used to make the background. I also used Journey Glaze and Stickles on the background. The paper and twine were from my stash. I made several of these at one time. I find that when I cut out Disney images it is best to make a few at one time. Once I start layering and putting it together it is super easy to make multiples of the same one. For me the work is figuring out what layer and color go where. Next up is a little Halloween fun. These two trick or treaters were cut at 3 inches using the Cricut cartridge Trick or Treat. A lot of glitter went into making these costumes sparkle. The pumpkin bag was cut at 1 1/2 inches. A Martha Stewart punch was used to make the fence in the background. The bat stickers are from K and Company as is the "No Tricks...Just Treats" sticker. The paper, glitter and twine are from my stash. I also used Liquid Pearls (white opal) on her hair and Enamel Accents on the shoes (white) and eyes (black). If you would like to see any of my other Cricut projects be sure to check out the links on my sidebar. I am also giving away some blog candy! All you have to do is leave a comment with a way for me to contact you and follow my blog either through GFC or Bloglovin. Your comment and follow must be received by midnight Sunday night to be eligible to win the blog candy. I will be drawing one winner on Monday October 7, 2013. What is the blog candy you ask? It is a surprise! I will announce the winner and the "candy" on Monday! If you get lost along the way or you encounter any broken links just start back at the very beginning. Don't forget there is Blog Candy to be won here. Thanks so much for hopping with us and have a magical day!! I love your blog !!! It is super cute , had to become a follower !! Your projects are amazing !!! 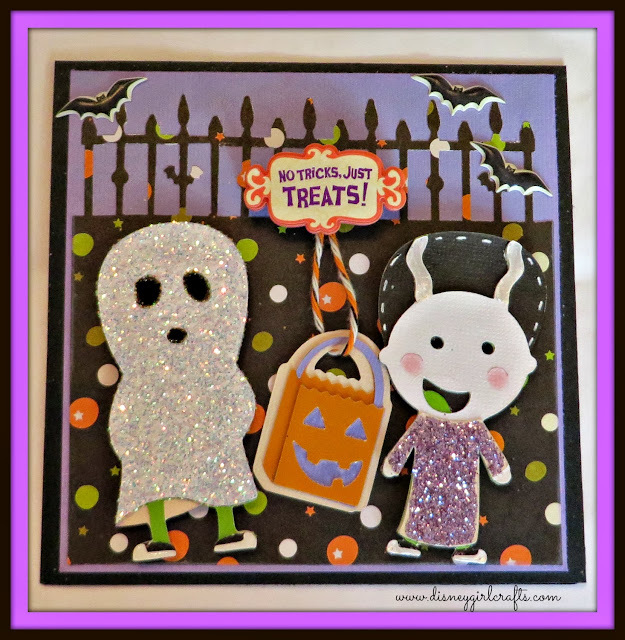 Love the Goofy and the sparkles on your ghost and Frankensteins bride !! Your Goofy card is super cute! Your projects are both adorable. I agree completely about doing a few of the same images at once when there are several layers involved....so much easier! Plus,isn't it great to be working on something and already have one big component ready to go? Love that. I'm a new follower so I can be sure to see your future projects as well! So adorable! Makes me want to take my Disney cartridge out and play. Cute! Cute! Cute! Love the Goofy card and the Halloween card is adorable. Love all the sparkle. So cute and lots of glitter. Goofy is adorable! Awesome cards!! Love the sparkle on Goofy's card and all the details on your Halloween card. TFS. I'm a new follower. Love both of your cards! The glitter on both cards add a beautiful touch. Nice hopping with you today! So cool, Brenda! I didn't know you could get such great detail cut with that Cricut! Wonderful Blog Hop! :) I am going in order! Your cards are truly amazing! You do a fabulous job with your layouts and getting them all put together. Both projects are superb. Wish I had those carts to play with. New follower too. Love, love how you layered them. Aha... Goofy.... got to see my fav guy after a long time. Grew up on them. Simple funny and happy.